Shakespeare In The Churchyard. 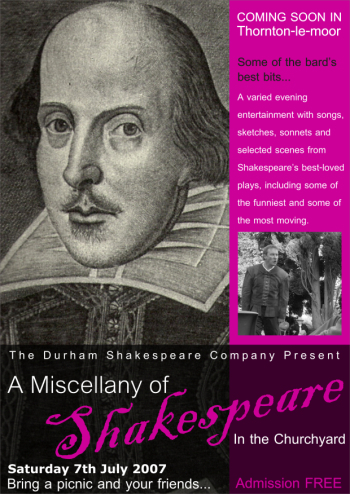 The Durham Shakespeare Company present A Miscellany of Shakespeare. Brian Forbes has very kindly arranged yet again for The Durham Shakespeare Company to visit TLM and put on a show in the churchyard. Please bring your family, friends, a chair or blanket and a picnic along and enjoy! A varied evening entertainment with songs, sketches, sonnets and selected scenes from Shakespeare’s best-loved plays, including some of the funniest and some of the most moving.